As a recent vacation approached we found ourselves at a loss for what to do. Too short for a meaningful trip home but too long for milling about Tokyo, we searched for ideas. Even though we've been here almost a year, there is still so much of Japan that we want to explore and experience. How to choose? Finally, we found an answer - WWOOF! WWOOF (Worldwide Opportunities on Organic Farms) is an international organization that connects large and small organic farmers with volunteer workers. In exchange for helping on the farm, WWOOFers (as the volunteer workers are commonly called) get food, accommodation, and information about farming and organic lifestyles. This simple idea - connecting those who want to learn with those who need a little help and are willing to share what they know - quite literally opens the door of a home allowing the traveler to experience their country of choice in a more intimate way than is normally possible. It is also incredibly affordable. The membership fee to WWOOF Japan and our travel expenses were pretty much it. (I did take along some of the yuzu marmalade I'd made as a gift, a practice I highly recommend. Gift-giving is by no means required, but it's a thoughtful gesture from a stranger entering a new house to live for a week or more.) The affordability of WWOOFing paired with the opportunity for a unique travel experience have led it to buck the trend of sliding interest and membership during this economic downturn. Some even theorize that the current economic crisis is helping fuel WWOOF's increasing numbers of both volunteer workers and farmers. We wanted to head south to be just a little bit warmer, and because we'd already seen some of the North on our way to Hokkaido this summer. We were pleasantly surprised to see a number of WWOOF hosts seeking WWOOFers in January, a month we initially thought would be challenging for finding a place. We spotted one on Shikouku, and made contact. 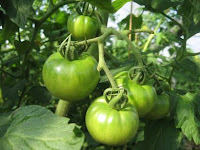 Ikumi Tomato Farm is literally a five minute walk from Ikumi Surfing Beach. Yuzu and ponkan orchards line the roads and the steep hillsides behind the farm, and roadside stalls were full to overflowing with bags and crates of fruit. Green leaves and warmer temperatures greeted us when we got off the bus to meet Tomoya-san, the farmer and our host for the next six days. A former advertising and marketing salaryman in Tokyo, he became dissatisfied with his work. A year's sabbatical biking in New Zealand took him by and to a number of farms.There he found a new face of farming - passionate craftsmen and women who found in their daily work a way of life requiring intellect, creativity, and tenacity - strikingly different from the stereotypical image of farmers he'd previously carried. And, despite the hard labor and long hours, they were happy. After a year of intensive agricultural study in Kochi, Tomoya-san rented the greenhouses and farmhouse with garden nearby. He's been courting the tomato ever since. Beautiful, slightly chilly, blue sky days outside instantly became heat-saturated summer afternoons inside the four greenhouses full of strong, healthy, and blooming tomato plants. We worked about six hours each day removing spent blossoms from new fruit, sweeping and tidying the black plastic mulch, and trimming leaves. Sometimes we could even hear the ocean waves pounding the beach. 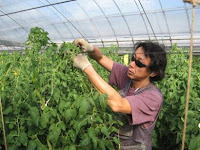 The occasional buzz of the Japanese bees Tomoya-san keeps in the greenhouse for pollinating were the only other sounds. We also did other chores - digging a new compost pit; trimming the hedge at the back of the greenhouses; and some household tidying - that seemed a little "off message" initially. Yet, these tasks - running a household, maintaining a property, and implementing organic practices for the home garden - are all part and parcel of farming, too. Tomoya-san readily shared his knowledge of farming with us (as well as his amazing cooking), so if a little vacuuming made it possible for him to focus on the plants then so be it. Farm geek that I am, I thought it a more than fair exchange. 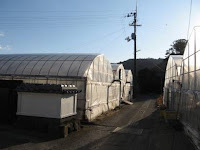 I found it utterly fascinating to work in the greenhouses and talk with Tomoya-san about his farm. I learned so much, and despite peppering him with questions each night about everything from organic farming to why he chose the tomato (he wants to show people what a really good tomato can taste like) to Japanese agriculture (he's concerned about the aging population and lack of organic farmers) to music (he loves Latin music but also has almost the entire collection of Earth, Wind and Fire) to food (he often uses anise in his miso to liven up the flavor) he offered to have us back again. We also plan to WWOOF again elsewhere. A chance to spend meaningful time in a new and beautiful place while helping produce food that's healthy for everyone in just about every way seems like a no-brainer to us. WWOOFing offers a world of possibilities for the traveler looking for a deeper and different kind of experience, and we're hooked.